The Supplemental Nutrition Assistance Program (SNAP) provides over 45 million low-income Americans with monthly benefits that can be used to purchase most foods and beverages. Each year program participants spend roughly $70 billion in SNAP benefits, including more than $22.4 million at farmers markets in 2017. While SNAP helps low-income Americans purchase food, the program also supports farmers and farmers markets in all 50 states. The Food Stamp Program has existed in various forms since the 1930s. The Food Stamp Act of 1977 defines the program’s goal is “to alleviate hunger and malnutrition … by increasing food purchasing power for all eligible households who apply for participation.” In 2008, Congress re-named the program the Supplemental Nutrition Assistance Program (SNAP). Every 5 years, SNAP is reauthorized by Congress as part of the Farm Bill. The reauthorization establishes who is eligible for SNAP/food Stamps and addresses program access, benefit levels, and other matters. Because SNAP is administered by each state, the program often referred to by its state name, such as “CalFresh” or “Lone Star.” USDA lists the state names for the program on this chart. Electronic Benefit Transfer (EBT) is a system that allows customers to use SNAP benefits from a government-issued debit card at farmers markets as well as brick-and-mortar stores. All states now use EBT to issue SNAP benefits rather than the old system of paper vouchers. Markets must be licensed by the Food and Nutrition Service (FNS) to accept EBT SNAP benefits. SNAP customers redeem their benefits by swiping their EBT card on a point-of-sale (POS) terminal at the market in exchange for tokens or a paper receipt, which they can use to buy eligible food products from participating vendors. Farmers and vendors can become authorized to administer their own SNAP program, but it’s most common for markets to use a centralized POS. The United States Department of Agriculture (USDA) partnered with the Farmers Market Coalition (FMC) from 2014-2017 to provide eligible farmers markets and direct marketing farmers with free EBT equipment necessary to process Supplemental Nutrition Assistance Program (SNAP) benefits. Read more about the outcome of this program here. Farmers markets are making real strides in increasing fresh food access for low income SNAP participants. 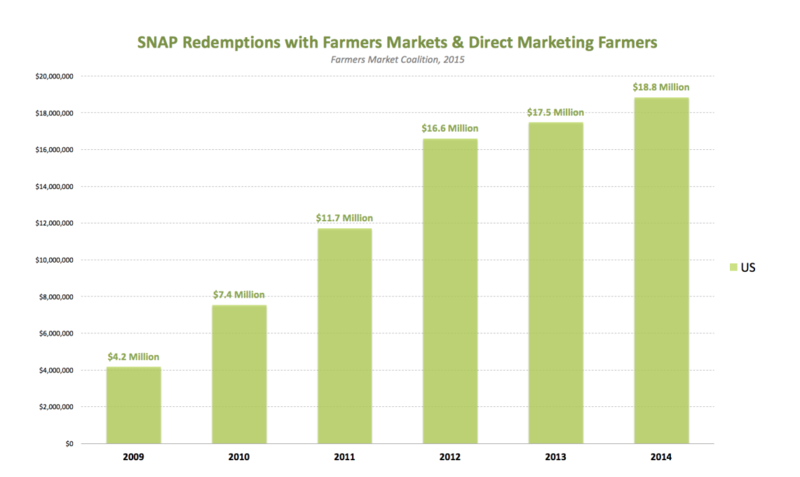 $24.4 million in SNAP benefits were redeemed at farmers markets across the US in 2017, a 35.2% increase from 2012. This dramatic increase can be attributed to markets investing in innovative outreach, education, and incentive programs, and support from federal, state, and local government. $24.4 million is a number to be proud of, however, it represents only a small fraction of total SNAP sales. Nevertheless, the rapid growth of SNAP usage at farmers markets in recent years demonstrates that even a small increase in the percent of SNAP benefits spent at farmers markets can make a real impact—more fresh, nutritious foods going to families who need it, and millions of dollars in revenue going directly to farmers. Learn more at the USDA’s SNAP at Farmers Markets website. SNAP is an entitlement program, meaning that all eligible people can receive benefits. Therefore, the program’s funding increases when the economy is weak and contracts when the economy is strong. However, eligibility criteria, benefit levels and other issues can be changed every 5 years when Congress reauthorizes SNAP as part of the Farm Bill. The 2018 farm bill included language directing FNS to allow farmers markets “to operate an individual electronic benefit transfer point of sale device at more than 1 location under the same supplemental nutrition assistance program authorization.” This language seeks to resolve an internal FNS policy that required that each farmers market location obtain its own EBT authorization number and machine regardless of whether the multiple locations are operated by a single organization. 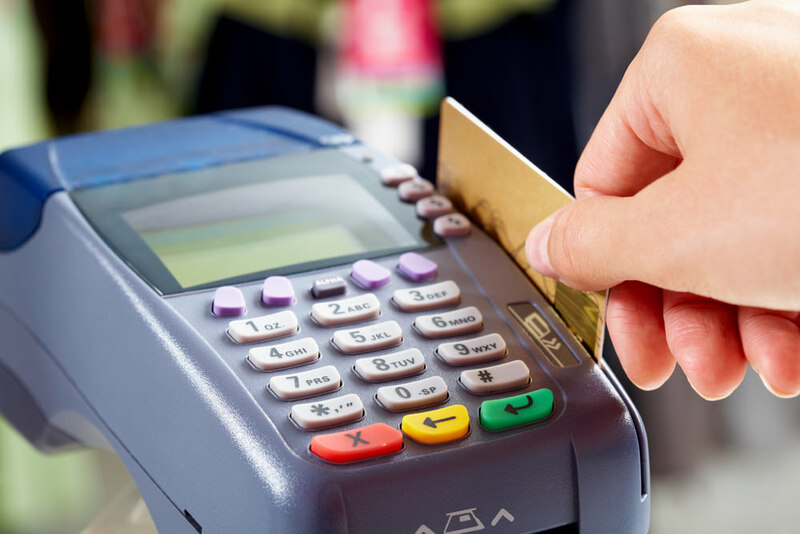 Organizations where required to purchase and pay monthly fees for each additional machine. This language comes as a result of advocacy by FMC, our members, and partners and will decrease the cost of administration and increase SNAP access at farmers markets. State agencies regularly negotiate contracts with payment processors to handle statewide SNAP transactions. These contracts can include provisions that provide non-traditional businesses, such as farmers markets, with no-cost wireless SNAP processing equipment. For more information on states that include provisions for no-cost equipment in their contracts, please refer to our state resources page. If you or your organization is interested in advocating for an improved state SNAP contract, please contact policy@farmersmarketcoalition.org. State agencies and legislatures are able to establish programs to help cover the cost of establishing and operating a farmers market SNAP program. FMC is working to provide state associations and other market advocates with resources they can use to advocate for state support to help markets accept SNAP. These resources include examples of state legislation and programs that support SNAP at farmers markets, contact info for state officials, and an advocacy toolkit. Please send any information you have about state legislation and programs to policy@farmersmarketcoalition.org.